Google News aggregates stories from over 25,000 news sources updated continuously. 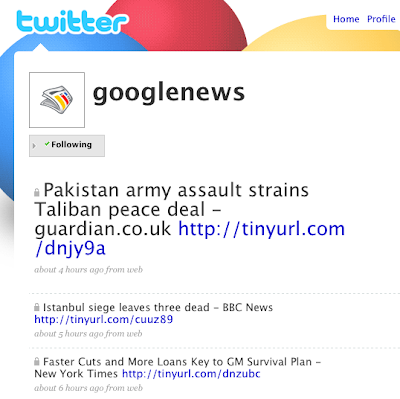 Starting today, we're offering users an additional channel to follow the news by posting links to top stories as they become available on the new googlenews Twitter account. As with the Google News homepage, click on any headline that interests you and you'll go directly to the site which published that story.